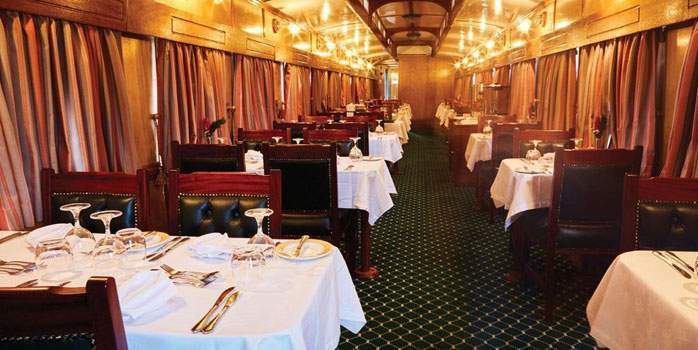 Offered by the luxury train operator, Rovos Rail, this 15-day journey offers a golfing and non-golfing leisure itinerary with an amazing insight into virtually every well-known destination in South Africa. 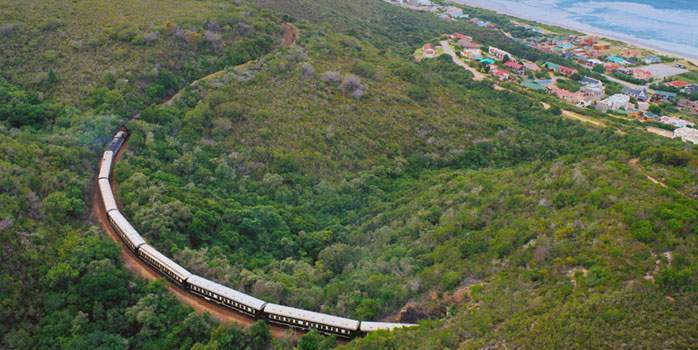 Starting in Cape Town, this magnificent sojourn meanders along South Africa’s renowned Garden Route and Hermanus. After traversing the Outeniqua Mountains, you arrive in the natural paradise of Knysna to enjoy a ferry ride across the lagoon to Featherbed Nature Reserve. 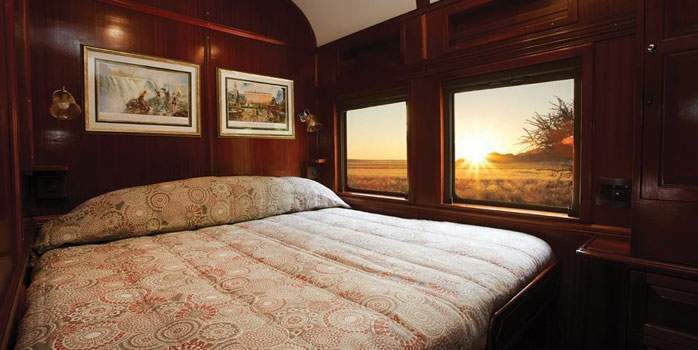 Guests will then move onto Oudtshoorn to visit both an ostrich farm as well as the Cango Caves followed by tours of Bloemfontein, Kimberley’s Diamond Mine and the historic desert town of Graaff Reinet. 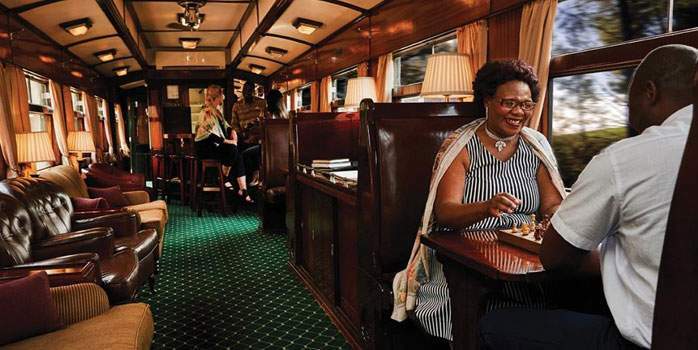 After that, the train arrives in Durban where Guests can feel the rhythm of Africa at PheZulu Safari Village. 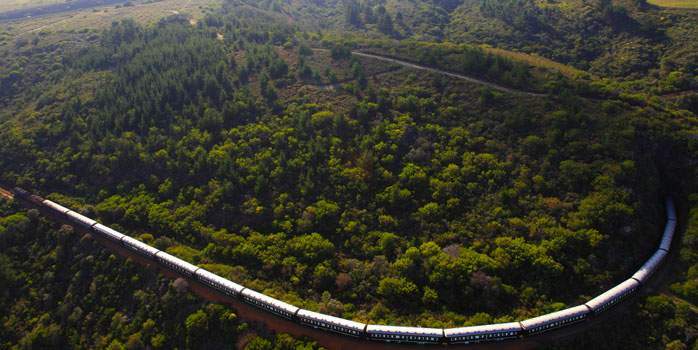 Then it’s on to explore the Kingdom of Swaziland, Hluhluwe Wildlife Park, and the world-heritage St Lucia Wetland Park. 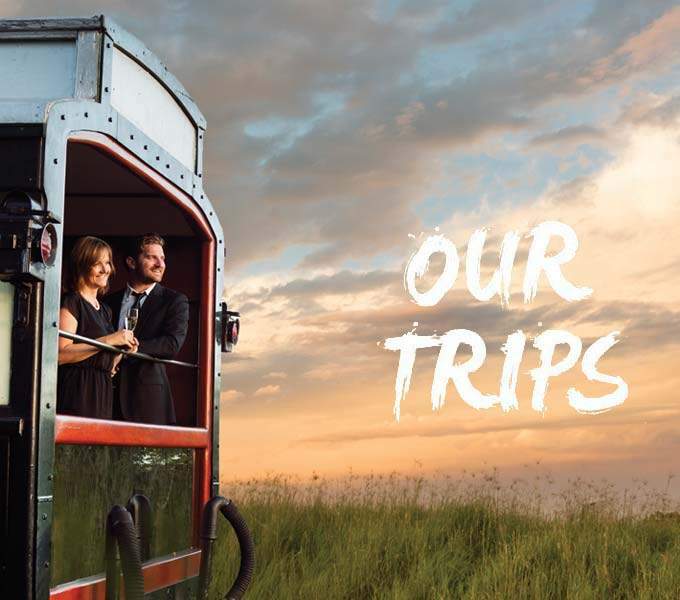 We then travel through the historical areas of Pilgrims Rest, Bourkes Luck Potholes and Gods Window before visiting Nelspruit, Kruger National Park and winding up into the Drakensberg Mountains. 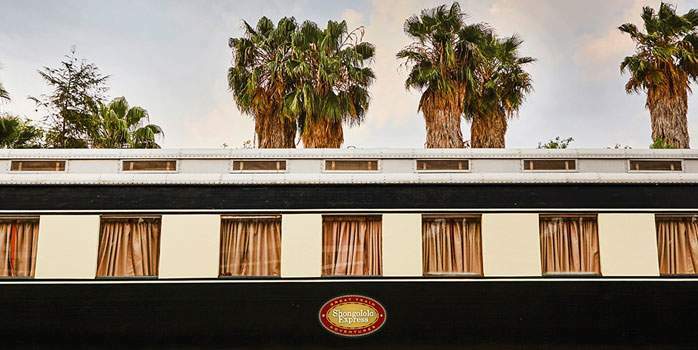 This magnificent voyage arrives back into Pretoria Station where guests disembark after a truly unforgettable experience. 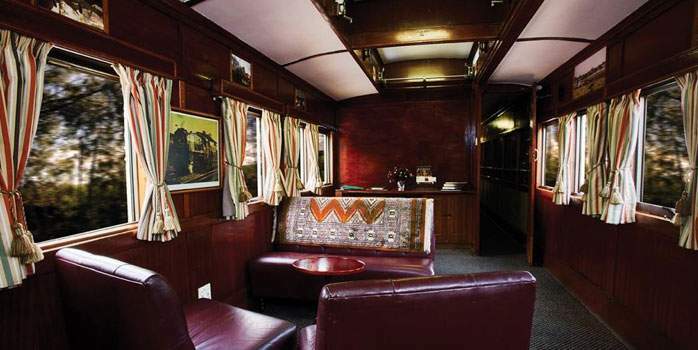 An identical itinerary is also available in reverse, from Pretoria to Cape Town. 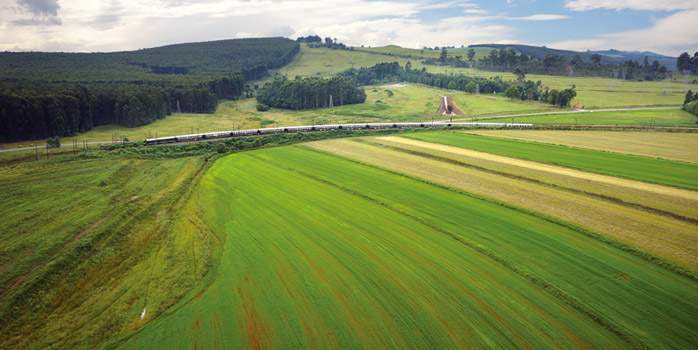 Golfers will have the option of picking & choosing to play a variety of world-class golf courses along the journey, green fees will be at an additional cost but transfers between the courses and the train are included as well as an onboard PGA Professional who will assist the golfers as well as offering tuition. 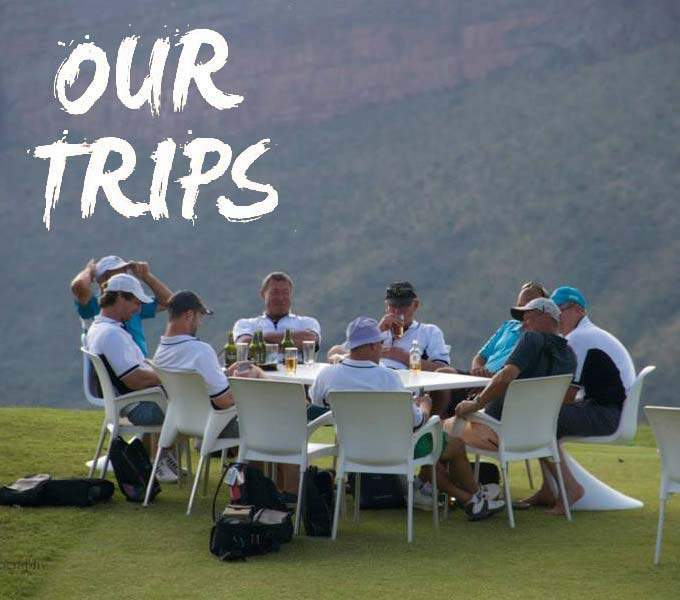 Golf courses (optional): Leopard Creek/White River/Nelspruit, Nkonyeni Swaziland, Zimbali, Durban Country Club, Champagne Sports Resort, Kimberley Golf Club, Fancourt, Ernie Els Oubaai, and Arabella Golf Estate. View the full itinerary here! 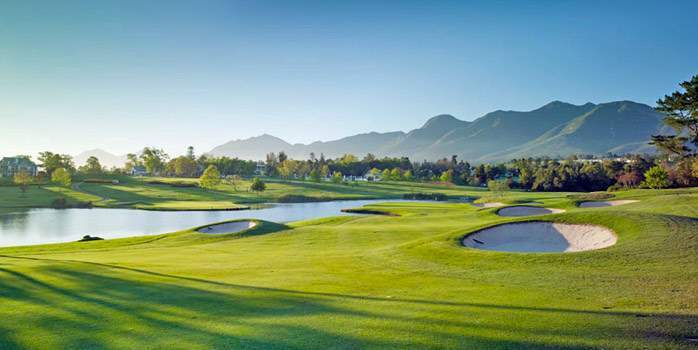 Ranked as the 4th best course in South Africa and #1 in Western Cape, the Arabella parklands course hugs the Bot River lagoon with spectacular views across the Kogelberg mountain range, stunning location for golf holidays in South Africa. 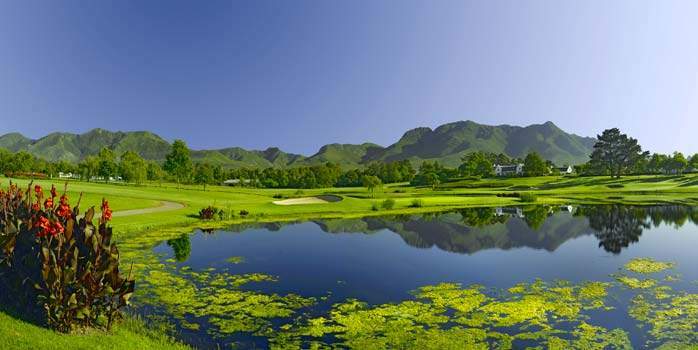 Designed by Peter Matkovitch, this 18-hole course encompasses the mountain backdrops, lagoon frontage and forests to provide a links, parkland and coastal aspect, while the individual fairways provide corridors from which to savour nature’s true beauty. An uphill challenge begins the golf experience which continues to be studded with achingly beautiful sights all along, thanks to the undulating slopes. The local water features are quite invigorating and make for a memorable round of golf. The championship layout is especially unyielding when played from the back tees. 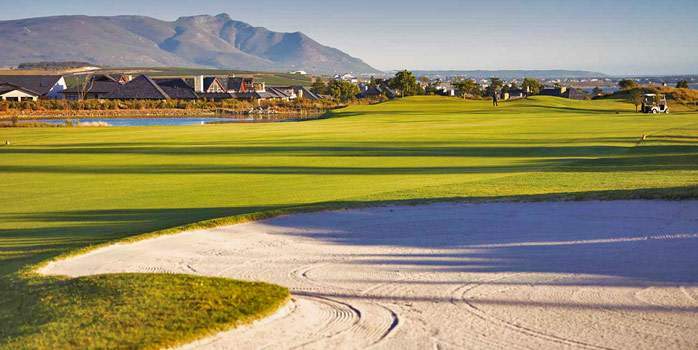 If you want to stay and play at a great resort during your South Africa golf holidays this is the perfect place. 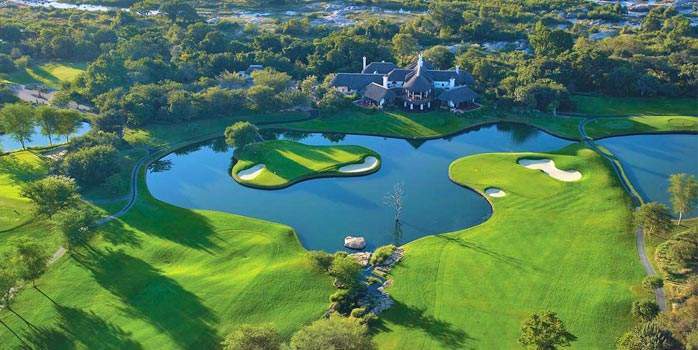 Internationally recognised as a world class golf course, Leopard Creek, designed by Gary Player, is located strategically for golf holidays in South Africa. The course typifies the essence of African golf at its best with indigenous bushveld bordering the pristine fairways and greens. 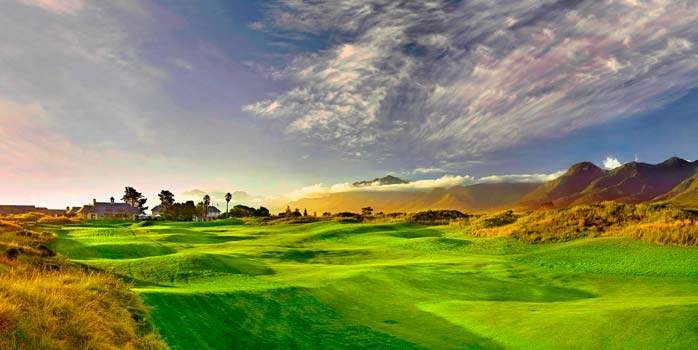 The course has hosted many PGA professional tournaments including the well known South African Sunshine Tour. 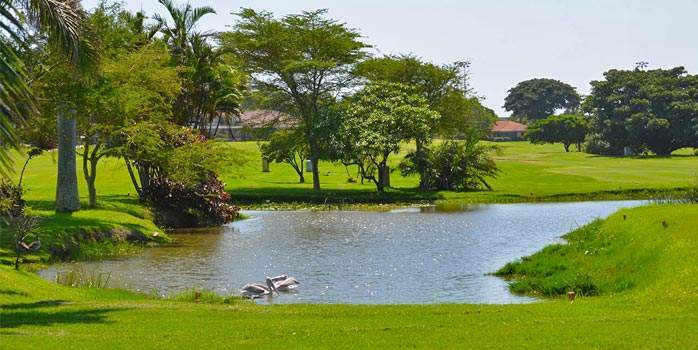 Home to the annual Alfred Dunhil Golf Tournament, this wonderful layout has numerous animals strolling on the fairways. It’s common to hear a buffalo snort or see a giraffe near the fence on your drive, while the pitch shot might need a hit over a lake full of crocodiles and hippos. The clubhouse, filled with golfing memorabilia, is one of the best in all of Africa: an extraordinary course for your South Africa golf holidays. 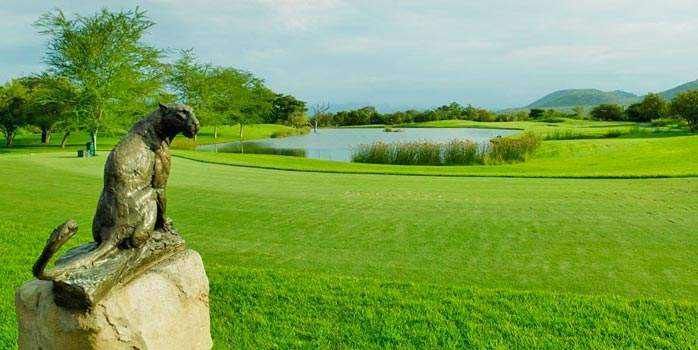 The Zimbali golf course was designed by Tom Weiskopf – his first in Africa – where he has incorporated natural features such as indigenous trees, vegetation and some beautiful wetland areas, whilst still managing to challenge players of all handicaps. 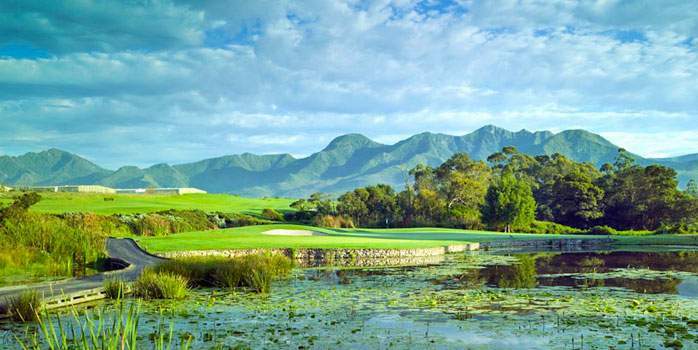 The course is an outstanding choice for golf holidays in South Africa. 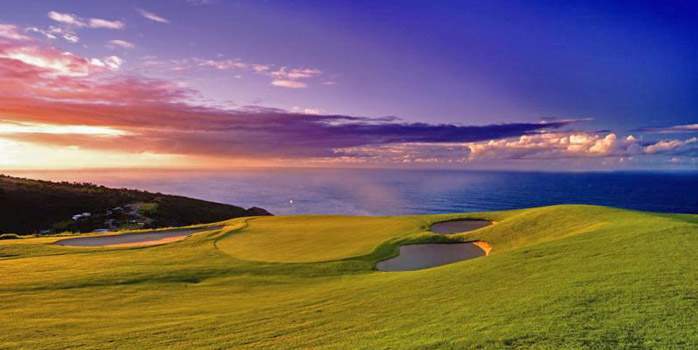 A truly spectacular golf estate which offers up sweeping panoramas of the surrounding, ocean, hills and forest, Zimbali Country Club, opened in 1996 and has firmly cemented itself as one of the area’s favourites. Located just outside of Ballito on KwaZulu-Natal’s Dolphin Coast, Zimbali occupies some of the finest estate in the country. The course itself takes you along a front nine, links layout before turning and blending into the coastal forest and wetlands for the back nine, providing a very different challenge and an opportunity to come back at your opponent. You know you are in for a golfing treat when your golf course gets featured on top 100 lists of the world’s finest golf layouts for many years. 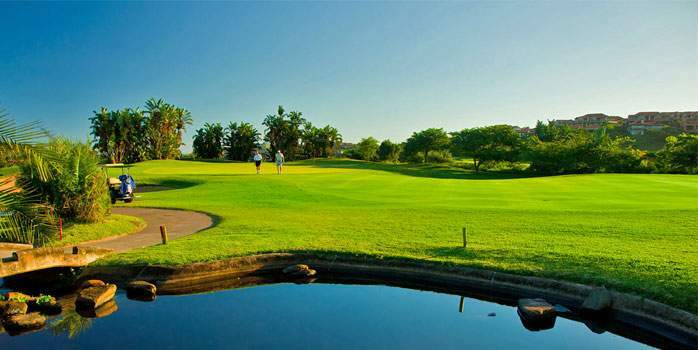 Add to this the distinction of possessing the greatest third hole in the world, and the Durban Country Club becomes the perfect golf course for a golf holiday in South Africa. 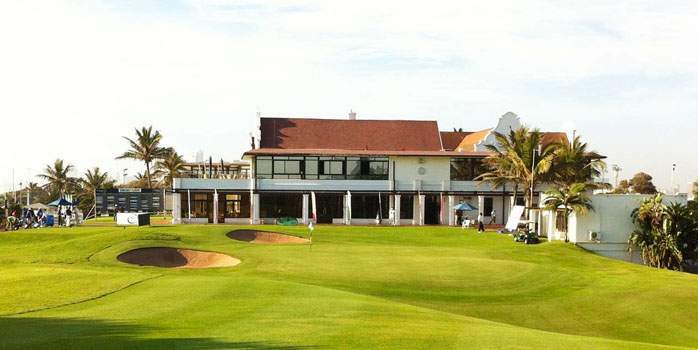 It comes as no surprise then that it has been the chosen venue for the SA Open Championships 14 times. The rare combination of scenic surrounds with a challenging course make a South Africa golf holiday at Durban Country Club uniquely memorable. The course is extremely demanding and requires you to play well in order to score well. The renowned par 5 third hole has a truly magnificent aura, following a narrow and undulating valley to a challenging target. The first five holes provide a testing challenge, leaving very little margin for error on the narrow, bush-lined fairways. The elevated tees and steep slopes combine with the strong onshore winds blowing through the valley to make it a course that is often enjoyed but seldom mastered. 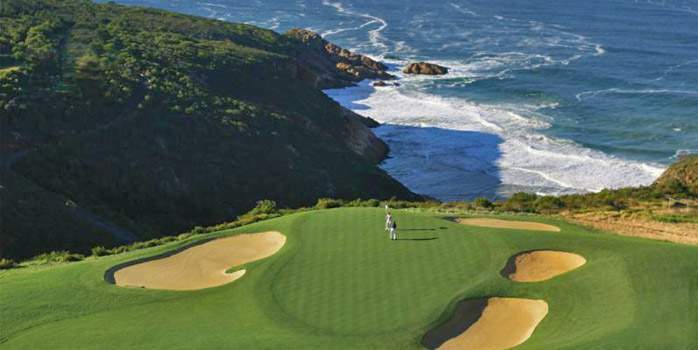 Oubaai is golfing heaven for a golf holiday to South Africa: idyllic yet challenging and wrapped up in the most breath-taking scenery on offer along the Garden Route. 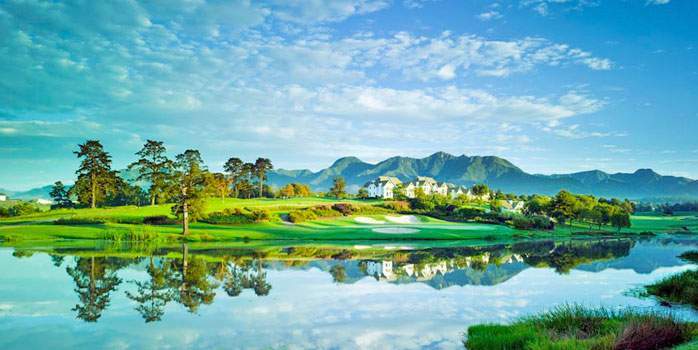 Perched on the edge of the hill cliffs leading down toward the Indian Ocean and with the Outeniqua Mountain Range as a majestic backdrop, the club enjoys the best of both worlds. The fairways undulate over the hilly terrain and the grounds are in immaculate condition. 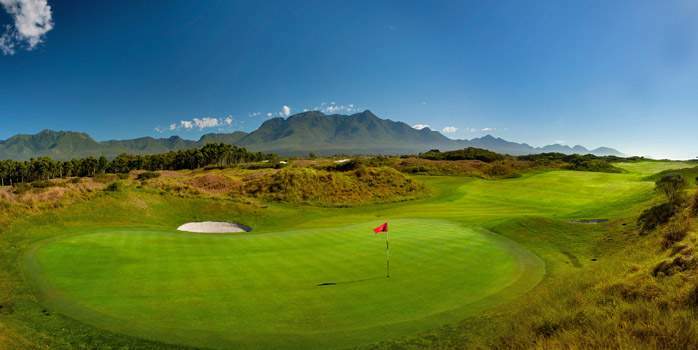 The first Ernie Els signature course in South Africa boasts a traditional links layout with veld grasses lining the lush, well bunkered, fairways and a panoramic 180-degree ocean view. The course is surprisingly long for a coastal course, and, with five par 3s and five par 5s, it makes for an exciting game, requiring your undivided focus despite the plethora of visual pleasures all around. Watch out for the sea breezes that are a regular around this high cliffside location. The course is unique in that it is challenging yet friendly and can be played and enjoyed by golfers of all abilities.